To call Gonzalo “Sal” Torres’s career unusual would be an understatement. After graduating from UCLA and then the University of San Francisco School of Law in the ’80s, Torres became a partner at a law firm and represented companies such as Bank of America and General Motors. He left to be assistant general counsel at Arysta LifeScience and later moved on to hold various roles in and around Silicon Valley—including his current one as legal director of commercial transactions for Equinix, Inc., the world’s largest provider of IBX data centers, colocation, and cloud-exchange services. 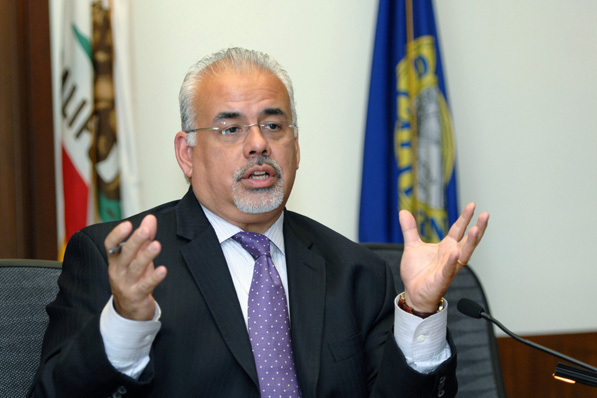 All of that makes sense, but then consider that Torres also worked as a teacher in East Los Angeles for one year, went on to host a radio program and a TV show—on which the comedian George Lopez once guested—and became a politician, serving as mayor of Daly City, California, and a city council member several times over. A closer look at his upbringing, reveals certain events that may have inspired his varied career. Torres’s parents moved from Peru to the United States in the late ’50s to start their family in East Los Angeles. When he was still in elementary school, they moved to what is now the Watts neighborhood during a tumultuous time for the city; Torres can vividly recall the Watts Riots. Even though he was only eight years old at the time and unable to understand the intricacies of the Civil Rights Movement, the event shaped his life. Torres attributes his work ethic—the quality that has enabled him to serve on the city council, hold down a full-time job, and raise a son and daughter with his wife—to his parents. He recalls how his blue-collar father would only take vacation time if it could be spent with his three sons, while his mother taught him to be grateful for the work he has. “My mom would say, ‘If you take your work for granted, there are always people waiting in line to take it from you,’” the director says. Torres jokes that in high school, he created a series of clubs just to become president of them. But truthfully, he says, he knew early on that he wanted to run for office and had dreams of becoming a state senator or governor. From law school to law practice, politics, and Silicon Valley, Torres has become used to being the only Latino in the room time and time again. Even after multiple situations in which he had to walk out mid-interview because of overt racism, he has never seen his status as the lone Latino tokenizing. Rather, when problems arise, he uses them as opportunities to provide others a teachable moment. Torres remembers being in law school and having a professor read case studies aloud. One such case featured two Latinos standing in front of a liquor store. The professor asked the class if they were up to no good, on the verge of doing something illegal. As he provided more details—they were wearing large coats, for example—Torres’ classmates continued to make assumptions seemingly based on race. Some thought that they were going to rob the liquor store, that their large coats were likely hiding weapons. Torres remains hopeful for continued development in how we address diversity. One of his biggest goals is for his job title to no longer follow his ethnicity. Torres is not a “Latino attorney,” he asserts; he is an attorney who happens to be Latino. The same goal and mission apply to his life in politics.